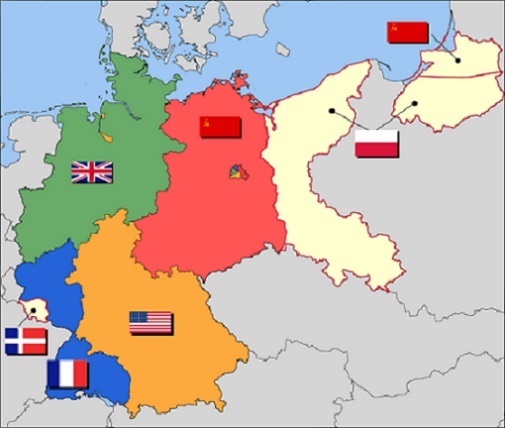 The Allied occupation by the four powers that defeated Nazi Germany resulted in the creation of four major post-war occupation zones in 1945 and the Saar Protectorate (Saarland) in 1947. The map above illustrates the occupation zones following the Second World War. The American zone consisted of Bavaria and Hesse in Southern Germany and the northern portions of the present day German state of Baden-Württemberg, shown, in dark yellow, in the map above. The Americans also had control of the Northern ports of Bremen and Bremerhaven. The British zone encompassed most of present day Northwestern Germany, shown, in green, in the map above. The French zone consisted of two non-contiguous areas along the German Border with France, shown, in blue, in the map above. The Saar Protectorate, or Saarland, shown in white in the map above, would become a quasi-independent state, but its economy and internal affairs were controlled by France until the end of 1956. On January 1, 1957, Saarland became a state of the Federal Republic of Germany. Many towns, primarily in the Soviet zone, created local charity stamps and souvenir sheets during early 1945. Some of them actually saw postal duty, though most of the issues were not officially authorized by any government or the occupying forces. Most of these issues were intended for sale to collectors, in order to raise money for local reconstruction projects or charitable organizations. Some of these local stamp issues will be described in the link section at the right. The Soviet zone consisted of the German states of Thuringia, Saxony, Saxony-Anhalt, Brandenburg, and Mecklenburg-Vorpommern, shown, in red, in the map above. The border area of Eastern Germany and the Southern part of the former state of East Prussia, were occupied by the Polish Communist government, shown, in light yellow, in the map above. The Northern part of East Prussia was annexed to the Soviet Union. The city of Berlin, located inside the Soviet Zone, was partitioned between the four Allied powers. THAT would result in an ongoing problem that would last for another 45 years! 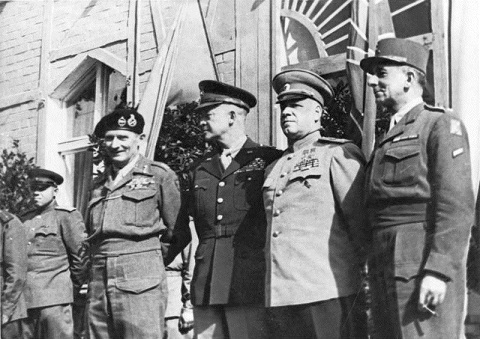 At the beginning of 1947, the American and British allied occupation zones were merged into what was called the "Bizone". In April 1949, the French zone was integrated into the Bizone, which now became the "Trizone". In May of 1949, the Trizone became the Federal Republic of Germany. In the same year, the Soviet zone became the German Democratic Republic. Georgy Zhukov (USSR), Jean de Lattre de Tassigny (France). The occupation resulted in the creation of many different postage stamp issuing entities. Web pages for them will be categorized by zone, year, and subject, and they will be presented in the page links column at the right. The pages for the Saarland Protectorate will be found in the "Saar" category of this website.